What makes you think offering a discount is going to be an effective way to close a deal? The reasons are many, but none of them make any sense. The key is to be focused on the value the customer will receive and the outcome they will achieve by buying from you. You can’t cut your way to prosperity. Sales leaders understand this, but do you? Your low price is not a sustainable competitive advantage; the only sustainable advantage you have is your people. Salespeople give too many discounts purely due to their own lack of confidence in being able to close the deal at full price. Compounding this issue is sales managers who fail to help build the confidence of their salespeople to believe in not only what they’re selling, but also in how they can help those to whom they sell. The issue is not the discount, but rather the lack of confidence that creates the discount. The challenge is the more we focus on price, the more committed we become to believing the only way to close the deal is with a lower price. If you’re not focused 100% on how you will help the customer, you will find yourself falling for discounts more than necessary. It’s for this reason I say it’s not just about what you sell or even how you sell, but rather it’s all about why you sell. You sell to help others. It’s not about the price. It’s about the outcome. 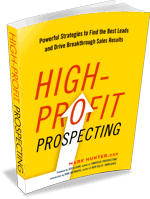 If you haven’t read my newest book, High-Profit Prospecting, you need to, as it will help you know how to attract full-price prospects. When you start with prospects who can pay full price, it’s amazing how much easier it is to get full price. For the month of June, Amazon has the Kindle version on sale for only $2.99! Grab it today and don’t forget to leave a review on Amazon. PrevPreviousWhat’s In Your Sales Pipeline? I don’t guess WalMart will be weighing in on this issue anytime soon? Grandpa was the cheapest mechanic in the county … he left over a million to his kids in the 80’s….